My students would look at the markings on the axes and almost always choose B. This year, I am trying a new approach. Draw the smallest rectangle possible around the graph. 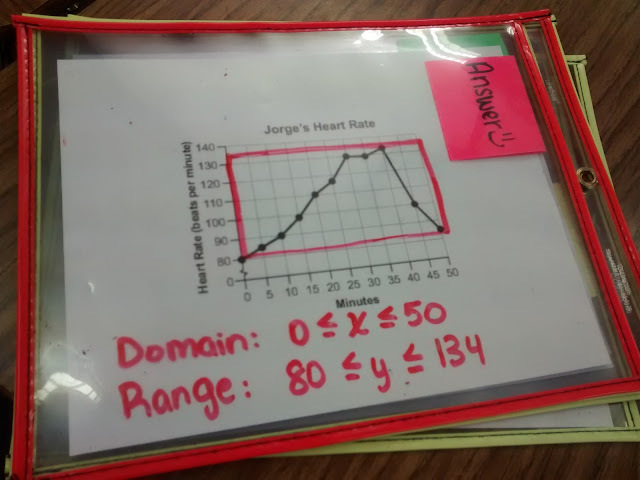 Use where the sides of the rectangle would intersect the x and y axis to find the domain and range. And, based on the quizzes I graded yesterday, it's working! Only 2 or 3 students accidentally wrote values that were on the axes and not on the graph. To practice before yesterday's quiz, I did a quick google image search to find five graphs. None of these are my images, so I don't think I can share the file with you. But, I trust you know how to google and find graphs to copy and paste, too. 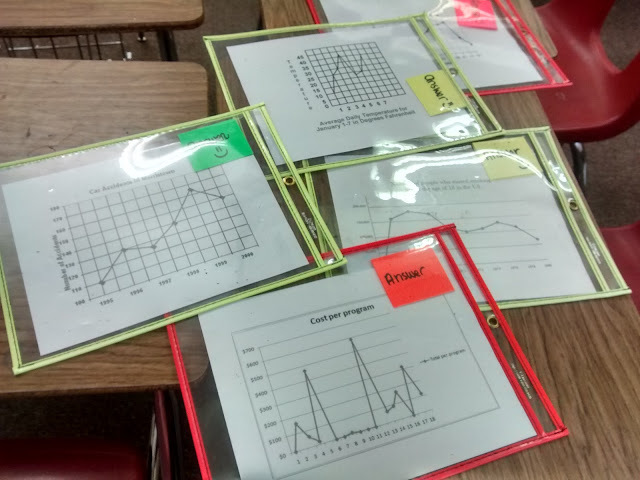 I enlarged the five graphs so they filled most of a sheet of letter sized paper, and I slid the papers inside these lovely dry erase pockets. Then, I took my handy dandy colored index cards, wrote the answer on the lined side, folded them in half, and slide them inside the dry erase pockets. Each group got a problem, a dry erase marker, and an eraser. Like with the percentage practice activity, I made each person "in charge" for one problem. This was the only person allowed to write on the board. The rest of the group had to assist, but they weren't allowed to write. One of the students who wasn't the one writing got to check the answer using the provided answer card. I also pulled out the red/yellow/green cups to set on each group's desks. As each group finished, they held their problem in the air, and I switched it out with a new problem. Drawing the box REALLY helps focus my students on what we are finding. This activity would probably work better in pairs than groups of 4. Next time I do this, I should make way more graphs than I think I need. I did four groups and had five graphs. 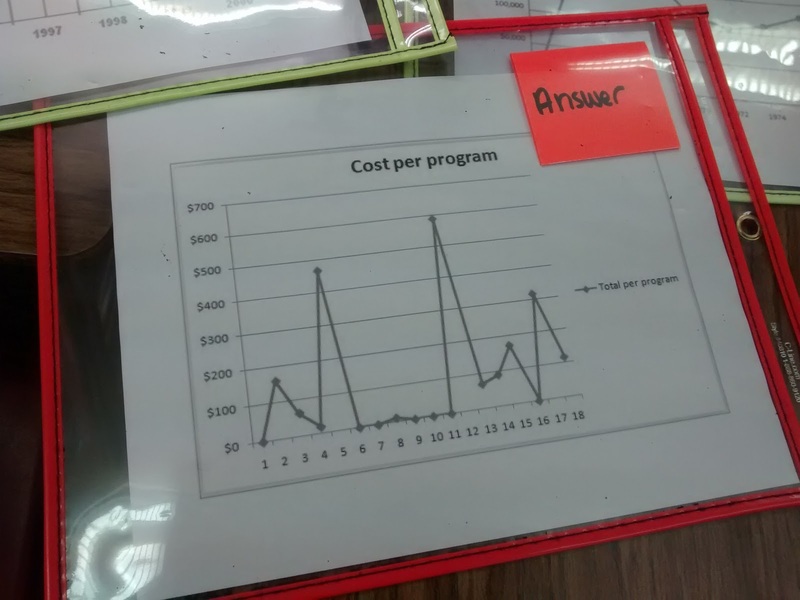 Some groups worked really fast, and they had to wait a long time for other groups to finish with the one graph they needed. I also want to mix things up in the future by throwing in some discrete graphs. My students love being able to check their own answers. I should keep incorporating this in the activities we do. This is BRILLIANT! Am ordering my dry erase pouches immediately! Thanks so much for sharing! And the awesome thing is you can use the dry erase pouches for sooooo many lessons! How do you get students to understand when the end behavior goes towards infinity? My Alg 1 students don't have to deal with that, but for other students I would talk about it going to infinity if we can't build a box to contain it. Hello! I have a question - where did you your graphs for his activity? Is there a nicely formatted set online somewhere that I can download or did you just collect them from all over the internet? I just did a google image search for graph. Next time, I think I'd try to collect sample graphs from released test questions. This was a last minute thing. Hey thank you so much for this great way to teach domain and range! I have struggled for years to get kids to understand this, for the first time I felt successful!